First is the one who started it all ~ my love affair with this wonderful breed. He was a wonderful character who was afraid of his own shadow, but together we overcame his fear.........and in return he taught me there was much more to life than what my life was full of at the time. 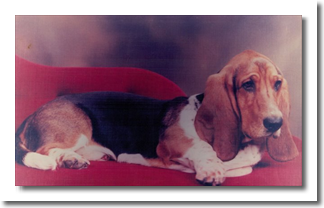 He opened a whole new world to me and for that I will be forever grateful to this fellow who was born a Basset but who died a true gentleman and friend! Arthur - my little soldier was a funny little boy who never really grew up. Wicked wasn't the word - if there was mischief to be done Arthur was the one who would find it. I could never stay annoyed with this sweet man for very long whatever mayhem he created! - he was a character with a heart the size of a lion......His first Christmas he became addicted to the tree baubles, nothing broken once removed he would give them immediately to my mum for safe keeping?? 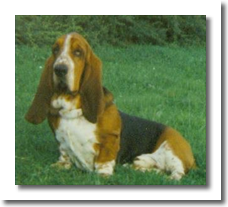 Anna my first Basset girl, had the sweetest of nature's which she passed on to her two children. She was out going and ruled the roost with no messing from the boys Arthur and Christopher Robin. 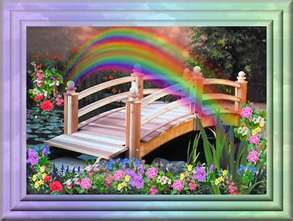 She always knew what she needed to do and when to wrap herself around your little finger, a look or wag of her tail she had that special little something and she kept it until the day she left me, bless her - a special lady with whom I shared a special bond. A reluctant mother of two puppies one boy, one girl. She shared my life for 14 years her personality is a great loss to our home. Alice was not a planned edition to our pack, Alice had a home which suddenly fell through, I asked if my name could be "penciled in" just in.... this beautiful girl came home with me at 9 weeks. She was my first red and white - but there was something about Alice, she wasn't the sharpest knife in the box but that only added to her appeal. 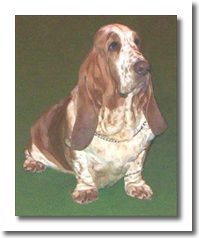 She excelled in the show ring - her first big win was at 8½ months winning the Reserve Challenge Certificate and Best Puppy in Show at the Basset Hound Club Championship Show under Mr Nick Frost. She gained her title winning 4 Challenge Certificates and 6 Reserve Challenge Certificates. Alice was a super star and lived as my shadow if I turned she was always there at my side. 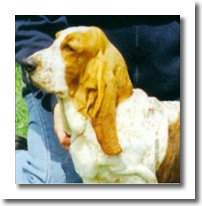 I suffered a massive blow loosing these two wonderful Basset Hounds girls only 18 days apart. 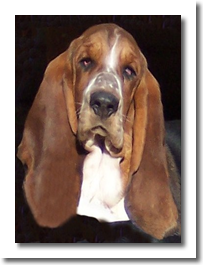 Betty was the in the first litter of Blackvein Puppies. She and her brother both stayed at home. Betty had a super temperament like her mum Anna. Although she was not shown prolifically because of campaining Alice, she was highly thought of in the showring. An unassuming little character, always willing to please and loved people of any description. She would walk around the benches at shows with no lead on, and people just fell in love with her as we all did. 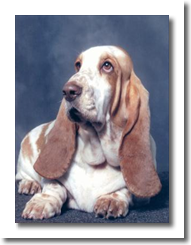 She would walk up to people and sit at their feet, looking all of the way up into their eyes - Betty was a people dog, she would not move until she had been made a fuss of!! Betty was taken away from me suddenly with no illness at just 6 years old......our little darling! Douglas was what you see is what you get, a joker, a big softy.......he would make a bed out of anything, wherever he could find it. 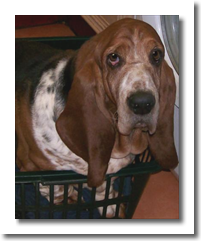 As you may be able to see in this photograph, the clothes basket is next to the washing machine......before all of the clothes could be added, Douglas was sat on top of them actually in the basket......we have laughed over so many things this gentle giant has done. A great character who loved our little granddaughter Kristen and would follow her about when she started to walk, as if to help steady her.....or it might have been for the biscuits she would ask for, for him because he was always a good boy for her.....his heart was pure gold - bless him! My dear, dear little Treacle.....I loved her from the moment I set my eyes upon her and knew she would never leave me. She was everything I hoped I would one day produce. I knew she was special, she filled my eye and my heart. In March 2009 I noticed two small lumps on her neck, within days they'd broken open. The vet was contacted and two days later she was operated on to remove two lumps from her neck and two from the side of her face. She had 59 stitches in her neck and 50 in her face. A biopsy confirmed the very worse - she had cancer, which was very aggressive. I was told because of her build and constitution I would probably have 6 months with her.......just 4 weeks after her surgery she was quietly put to sleep and out of pain. My heart was broken my sweet little princess.